Puerto Rico May 1 march against austerity repressed with tear gas, pepper spray, arrests | Fight Back! 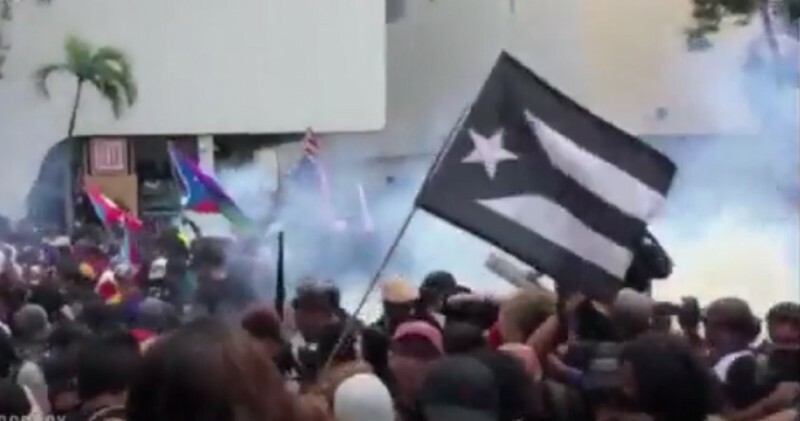 San Juan, Puerto Rico - On May 1, police in Puerto Rico responded to tens of thousands of people marching against austerity with serious repression including tear gas, pepper spray and arrests. The Puerto Rican Teachers Federation (FMPR) along with the Broad Front in Defence of Public Education (FADEP) called a strike on May 1 in opposition to the government’s plan to close hundreds of schools and privatize public education. Many other workers and other social movements such as Jornada Se Acabaron las Promesas, a movement that formed in 2016 to resist the colonial ‘Promesa Act’, also mobilized to the Milla de Oro in San Juan to oppose the harsh austerity measures that the Wall Street-imposed Fiscal Control Board is trying to implement. FMPR President Mercedes Martinez posted on Facebook about what happened: “Yesterday more than 60,000 people went to the Milla de Oro to protest against the austerity measures of the Control Board and Ricardo Roselló. Eight marches from different starting points. Workers, fathers, mothers, environmentalists, students, feminists, public health workers, religious people, retired workers, all with one voice demanding that they don't abide by the fiscal plans that drive us into misery." Video footage has gone viral on social media showing the police launching tear gas and pepper spray at the May 1 protesters. Around 20 protesters were also arrested. Video has also emerged of large numbers of police entering neighborhoods after the protest to track down people who were at the protest and taking them from their homes forcefully to arrest them. After the repression on May 1, another march was called for the evening of May 2 to demand that the people arrested on May 1 be freed, as well as continuing to protest the Promesa Act, the Fiscal Control Board, school closings and privatization of public education, the robbing of pensions, and more. As of May 2 in the evening, five of the people who were arrested on May 1 were reportedly still in jail. Noelanie Fuentes, a leader of the Puerto Rican Teachers Federation in Rio Grande, was an eyewitness to the tear gassing and repression on May 1 in San Juan. She said, “Yesterday I didn’t simply see young people, adults, kids or elders in a protest where they covered up our constitutional right to participate in one. Yesterday I also saw the face of the solidarity, hope, life and energy necessary to begin to stop the oppression, corruption and intimidation carried out by the supposed leaders of our country. I saw enough bravery to fight against the colonial system we live in and make our rights matter as a people. In that crowd which was trapped, there was no fear - there was courage, rage and indignation. Enough to not leave and to be there for hours fighting to accomplish what we had set out to do. Wake up boricuas, they’ve given us the signal, wake up from this dream, it’s time to struggle. We’re already awake and there’s enough of us to struggle, resist and win!"